Steal the show at your next party with the EL (Electro Luminescent) wire from Magnet Montreal. Light up your stage or Halloween costume with this cool gadget. The EL wire features 3 modes, always on, slow flash and fast flash. Spanning 3 meters long and 2.3mm thick, the EL wire is offered in 7 colors: red, white, blue, orange, lime green, dark green and pink. For full portability the EL and can be powered by a battery pack of 2XAA batteries or 8XAA for extended usage or longer sections (Note that the batteries are not included). The El wire can also be connected to a standard 120V outlet with the power adapter kit should you wish to use it for a permanent display. You can choose your powering option in the pull down menu on this page. You can also extend your 2.3mm EL Wire kit to 6 meters by adding a second 3 meter section to your set up, selecting the same color or even a different one for the second section. If you opt to go with 2 colors, you will also receive a Y shape splitter to connect both EL wires to your power pack. The EL wire is now also available in a larger 5mm diameter! The 5mm EL wire is thicker and brighter than its 2.3mm counterpart. Note that this item requires more power than the 2.3mm EL wire therefore you can only connect 1 5mm EL wire to the standard battery pack. Good news everyone! The 2.3mm EL wire is now available in longer sections of 10 Meters! For the best results with the 10m bundle, we recommend that upgrading your battery pack to the extended 8XAA version. We have also added a sound activated controller! Note that the sound activated controller for EL Wire is only available in a battery pack version (4 non included AAA batteries). There’s no always-on mode on the sound controller. The EL wire will flash with the ambient sound. If you select the Sound activated controller, you will also receive the regular battery pack for non sound activated operation. Are you looking to extend your EL wire, connect it on your car battery or have a custom project in mind? 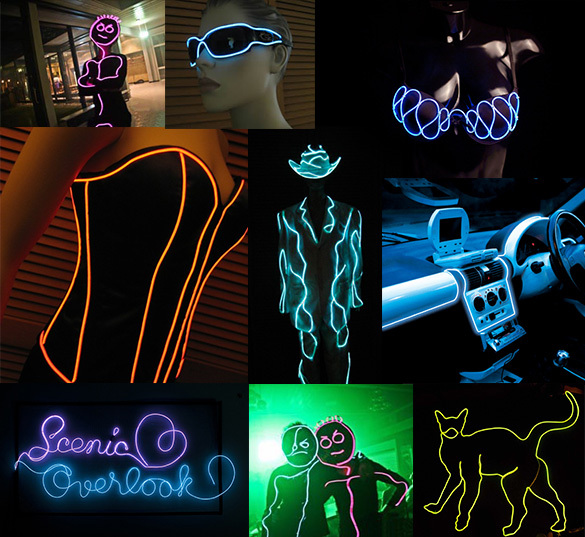 Then visit the EL wire Accessories page.